Confession #1: I keep putting off writing this post because I want to talk a little about the process of how I got to this design, and I knew it would lengthy knowing me and my tendency towards verbiage, nevermind my proclivity for runon sentences, ha! 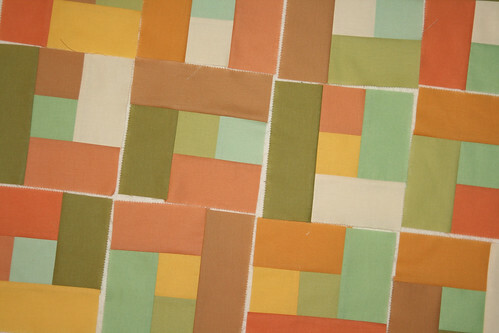 Confession #2: I have a terrible affinity for 80s pop, hence the working title of this quilt (and this post!) Apologies to those of you who end up with the tragically hip Dead or Alive's ditty rotating in their noggin for the rest of the day! So, I had this plan (famous last words!) to come up with a quilt design to use up some jelly rolls, but I wanted to do something a little different. I wanted something quick and easy and effective, using strips. 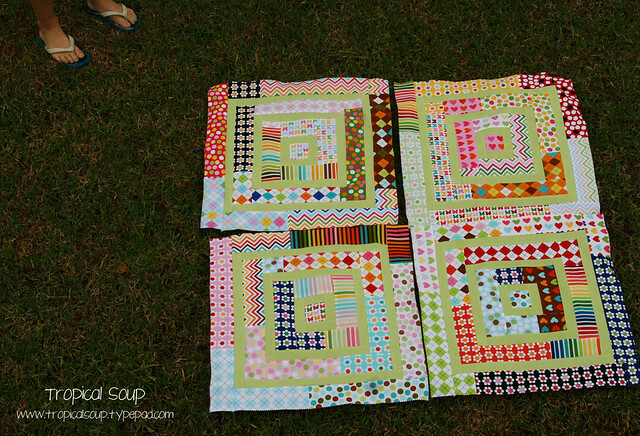 I considered doing a 1600/ jelly roll race -type quilt (I had no idea these quilts had a name back when I made some little snuggly quilts this way for the kids way back in 2008..pre blog. And pre precuts, ha. Note to self - photograph those, too!) 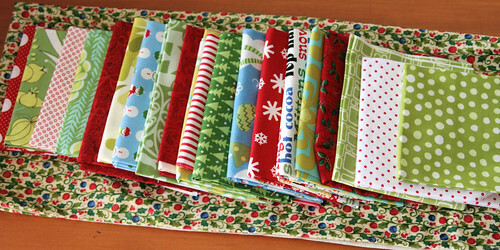 but I wanted something more, so then I considered maybe doing a 1600 quilt but adding a thin line of solid to the 1 long line of strips so that it would end up alternating rows of jelly roll and thin solid. But that still seemed more lineal than I was aiming for. So I started thinking about manipulating it into a shape - maybe squares or rectanlges...and then I thought maybe I should marry that idea with the thin solid strip idea with the 1600 idea...and this is where I went with it! And...I'm not sure. I really like the concept of the block, but I'm just not sure about colour execution here. The jelly roll I used is Ann Kelle's Remix which is full of gorgeous patterns and beautiful happy colours. I seriously considered using something like Kona Charcoal as the solid to give it a bit more grounding but I wanted to stretch myself by using a colour. I'm wondering if it is just way too busy? Maybe quilting it will tame it a little, I don't know. And I am planning to sash the blocks with the same width green tea, or possibly a smidge wider, so that might help calm things a little. What do you think? 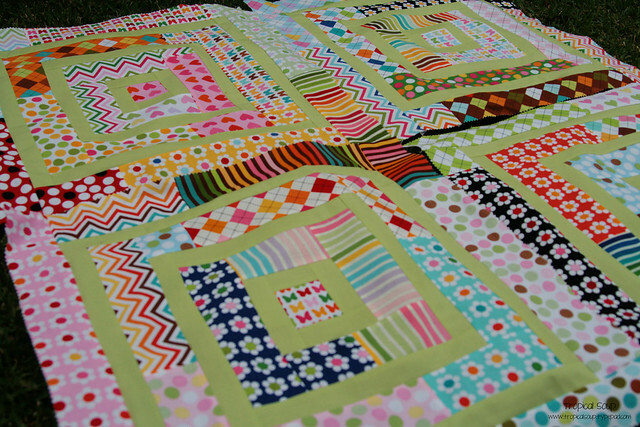 I only had enough of the Kona Green Tea to make 4 blocks (more just arrived on my doorstep yesterday!) so I am trying to decide how I feel about it and whether I want to make more! I really like the pattern idea though so either way i think I'll be trying it again in a different colourway with a different jellyroll, and maybe I can even rummage up a tutorial, once we get a combination that doesn't make your eyes smart! 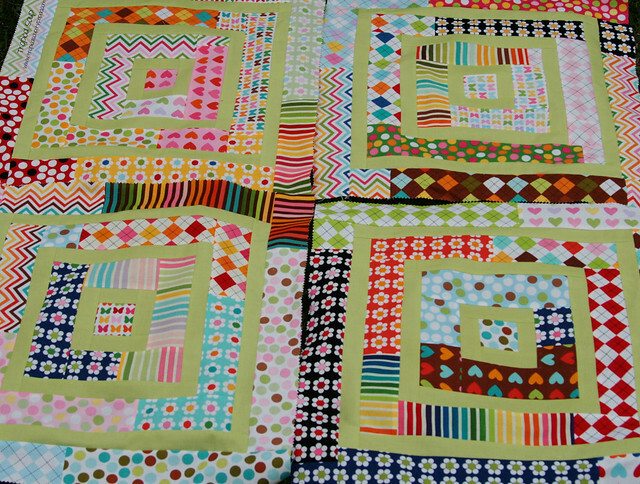 And yes, I did say write quilts...I have made 2 tops that are virtually mirror image rather than 1 big long skinny thing (quite literally the single quilt I had envisaged, just without the seam joining the 2 halves) Mostly because I have a particular quilting design in mind, and the thought of wrestling 80+ inches in the machine was making me less than enthusiastic. I am hoping to get them both basted by the time I collect small helpers from school tomorrow...check out Our Creative Spaces for more people doing stuff in their space. Creatively. Long long ago, in a galaxy country far far away just over the ditch, I made all the blocks for Oh Fransson's Paintbox Quiltalong. I did end up deviating from the pattern (surprise!) and instead of straight sashing, I bordered each block in white, and then trimmed them up on an angle, with block type A slanting left and block type B slanting right. And then I really really struggled with finding a layout that I liked, that worked visually, and the pile of blocks got put on the backburner for a while. Those blocks have been really preying on my mind lately, so earlier this week I hunted them out, and I finally (finally!) 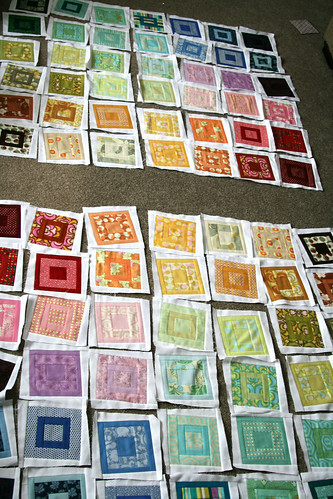 came up with a layout that seems to work, and uses all the blocks (84 is an odd number for quilts!) As it happens, a 7x12 layout will yield a quilt that just fits perfectly along the long back of our black sectional, will hwlp lighten up that black hole space (the Christmas quilt is intended for the same space) and also be the right size for snuggling under for movie nights. I really like this combo above, but with some solids added in the apple and lighter greens. 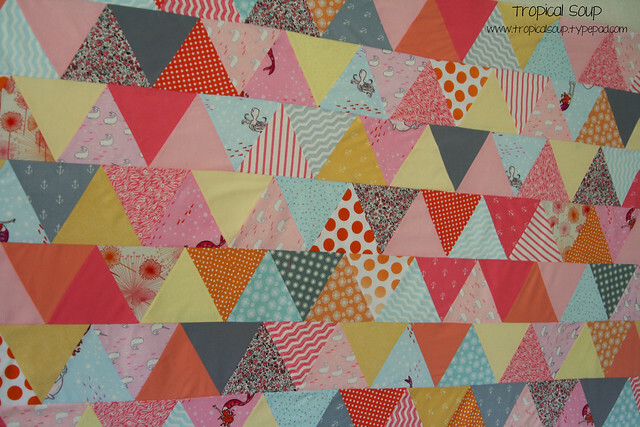 I'm thinking maybe a string quilt, a broken bento, or something completely improv...(Even since I started writing this blog post I've been back down to the studio to add in another half a dozen fabrics...I do love a scrappy quilt - even a tightly coloured scrappy!) Yum! Now, anyone care to hazard a guess as to which Christmas I'm aiming for a finish by? I'm joining Our Creative Space this week...there are some lovely things over there! 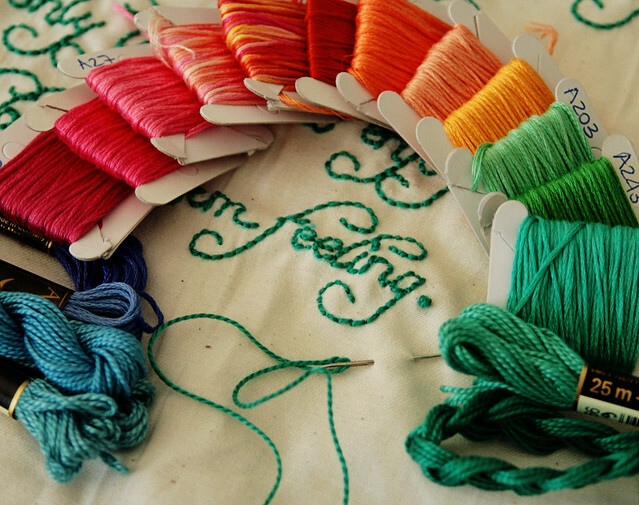 Anywaaaayyyyy.....I have this piece in progress at the moment, so there is a little stitching going on after all. It's for a friend, and I'm not sure if she reads my blog so I'm loathe to share the whole thing in case I accidentally spoil the surprise! I wish I could though...would love your opinions on how to finish it off - it's a funny, slightly off-colour (you should know me by now!) quote. 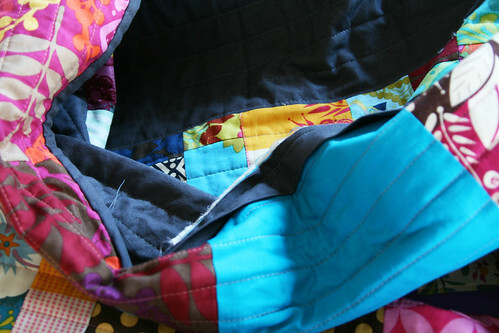 If I can drag myself away from Pinterest of an evening, I should be able to share the finished project here very soon! 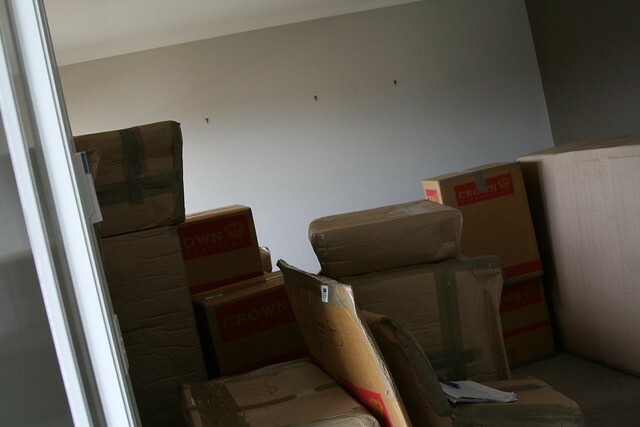 ...I am lost in a forest of packing boxes, packing paper, and assorted piles (of varying heights) of collected detritus. Yay - our stuff arrived! Boo - the magical unpacking and organising fairies did not. 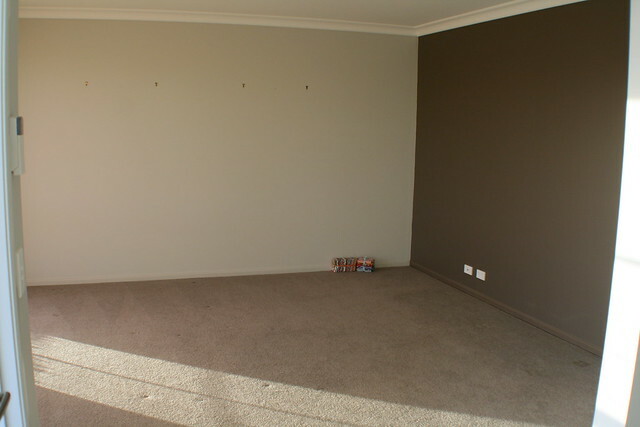 I am really missing this space - and you guys - and hope to be back next week! In the meantime, these are photos I took last week of my studio, intended for joining up with My Creative Space, but I got a little distracted! I have a jelly roll of Bella solids in the warm palette that has been calling out to be used, and so I started playing around a little tonight. I had in mind an improv wonky-ish plan but somehow ended up with the foundations of the humble (but oh so lovely) log cabin. And not even wonky log cabins at that! Do you find on your creative adventures you end up somewhere completely unexpected? I'm linking up with Kirsty at Kootoyou - be sure to pop in to see some truly adventurous creative journeys. Tootling through cyberspace yesterday I was catching up on a blog (I can't remember which, ack!) when I came upon the link to these Icebox penguins on the Diamonds for dessert blog. Commence squealing from cuteness overload. Cole, Imogen and I had a go at making these, and it all was going swimmingly, until it wasn't. Basically, my brain fell asleep and I put way too much in one lot of batter and not enough in the other and we ended up deviating rather dramatically from the original intention at that point. I ended up putting all the batter together (which resulted in exactly the right amount of flour!) 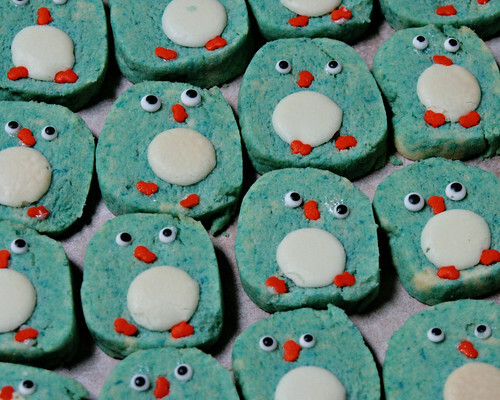 and so instead of inset penguin tummies, we just had tealish cookie dough. No problem - white chocolate buttons popped on top before baking took care of the tummies, and edible googly eyes and teeny tiny edible pumpkin sprinkles (hooray for finding those in the pantry!) stood in for beaks and feet. The munchkins were responsible for adding the ingredients into the mixer, kneading the colour into the dough (I love the marbled effect that 4-year-olds-tiring-of-the-task created! 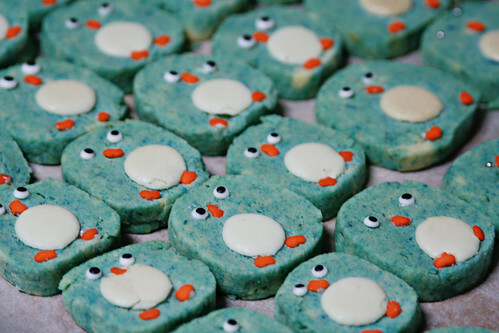 ), placing the cut cookies on the baking sheets, and attaching the eyes, beaks and feet. And quality control. Lots and lots of quality control at every step. Today I've sent 2 very happy and pleased-with-themselves little people off to preschool with cookies they all but made themselves. And we'll definitely be doing this again - maybe one day even the way the recipe intends! I find myself continually wandering past to get a glimpse of them, they are so cute. And then I rip one of their heads off with my teeth. I can say with certainty this batch has no hope of long term survival! 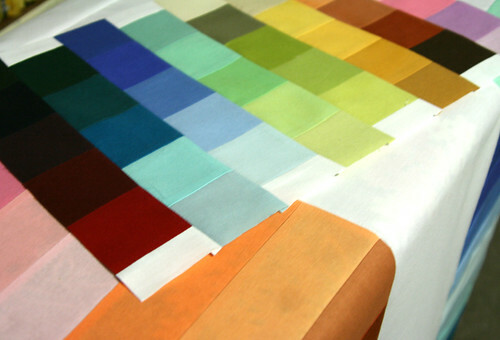 Visit more delicious creative spaces over at Kirsty's. ps. we had Ammalissa for dinner the other night. Cole took great delight in telling his sister that her baby was delicious, and then falling about laughing! Yes, this great hulking pile of quilted deliciousness is back, and requires only the handstitching of the binding and a label before it's completely finished*. yay! 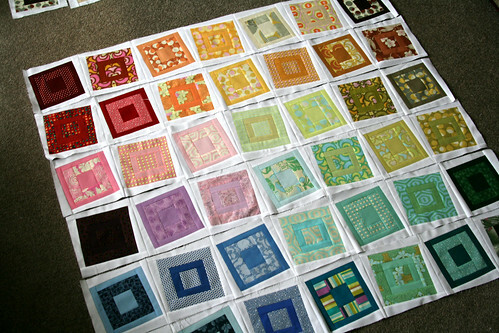 Unfortunately, the size of the quilt means that binding just goes on and on and on and oh did I mention I managed to cut the tip of one of my quilting fingers the other day and also can't find my little thimble for protection of said finger and boy does that slow down the whole process! I'm so pleased with how this quilt has turned out though, and can't wait to share - as soon as that damned binding is stitched down! 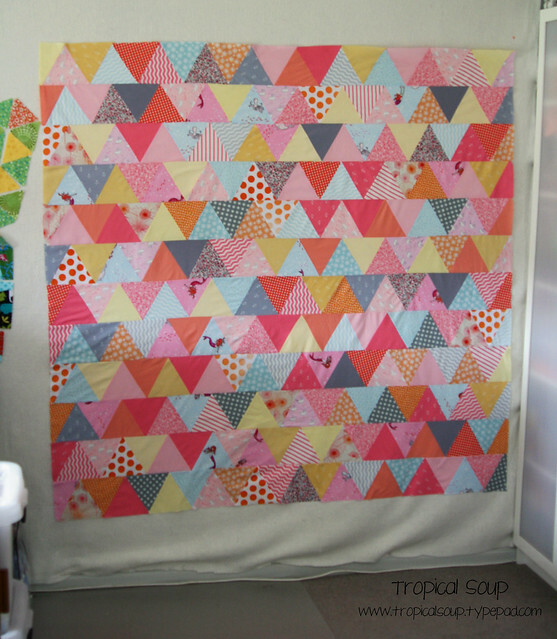 Have a look at some other gorgeous creative spaces over at Kirsty's...she's gone a bit quilty herself this week! *We may or may not be already sleeping under it, flapping unfinished binding and all. I couldn't possibly comment.